Recently, The Pampered Chef sent me a box full of goodies. 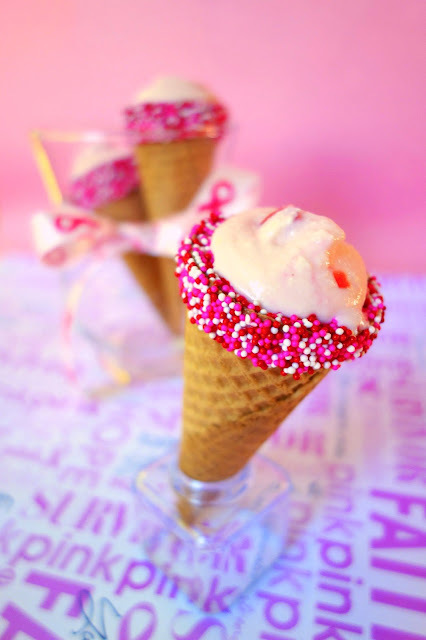 They asked me to make a pink recipe in honor of Breast Cancer Awareness Month. I decided to make these Cherry Cannoli Cones. Aren't they cute? They also taste great. This is a really simple recipe and doesn't require many ingredients. I drained the ricotta cheese overnight so it wasn't too wet. I sifted some powdered sugar, added some chopped cherries and a little cherry juice from the jar. Voila! Cannoli filling! Instead of making cannoli shells, I used sugar cones. I decorated the tops of the cones with some candy melts and sprinkles. You could also use mini chocolate chips or chopped almonds. These were so much fun to make and even more fun to eat! You can make the filling ahead of time and store it in the refrigerator until you are ready to eat the cannolis. Make sure to fill the cones right before you eat them so they don't get soggy. I made double duty out of the Stainless Mesh Colanders. I stained the ricotta in them and then used it as a sifter for the powdered sugar. I love these silicone prep bowls! My new favorite Pampered Chef product! 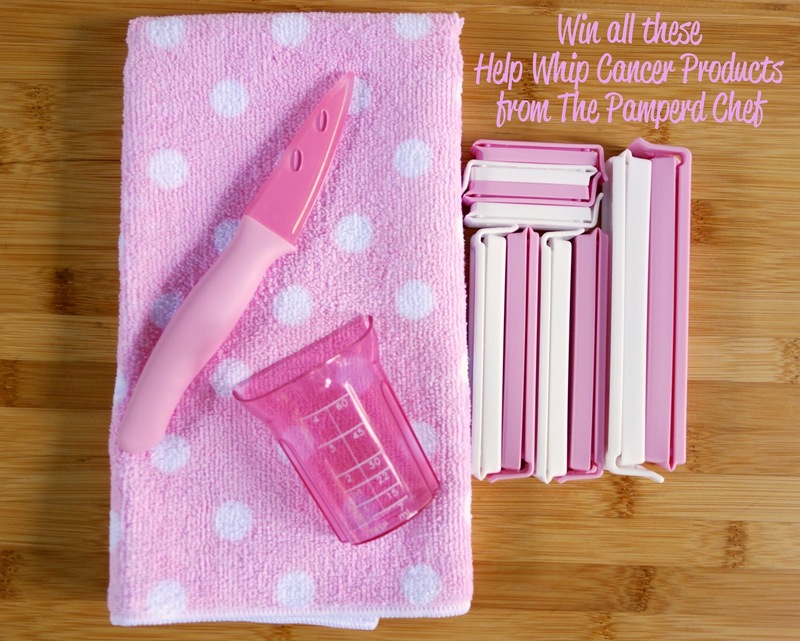 The Pampered Chef is going to send one lucky Plain Chicken reader a set of the Help Whip Cancer products! The contest ends @ 11:59PM on Friday, May 10, 2013. The winner will be notified by email and has 48 hours to respond. If the winner does not respond within 48 hours, an alternate winner will be selected. Good Luck! Line a strainer with a paper towel and place ricotta cheese inside. Place strainer over bowl and cover with plastic wrap. Place in the refrigerator overnight. When ready to use, squeeze out any excess liquid. Place ricotta in a large mixing bowl and add powdered sugar, chopped cherries, cherry juice and almond extract. Mix well. 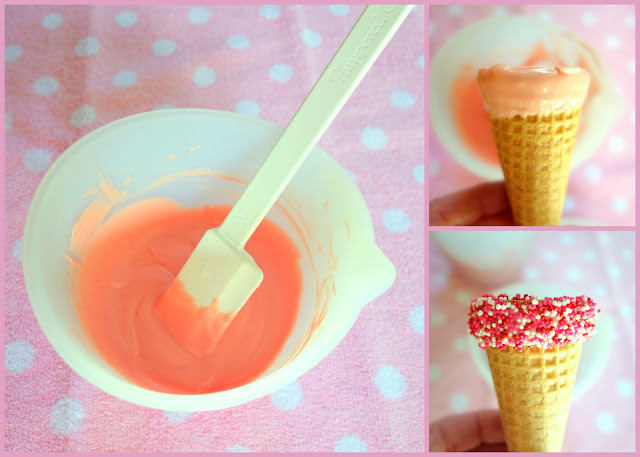 To prepare the cones, melt candy melts in a small bowl according to package directions. Pour sprinkles into another small bowl. 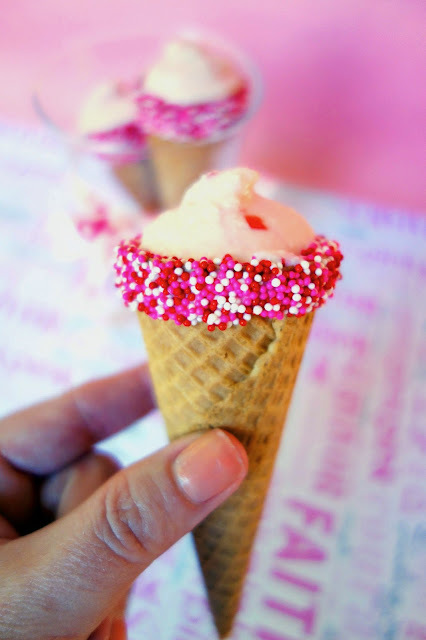 Dip sugar cone tops into the candy melts and then into the sprinkles. Set aside to set. Right before serving, fill a pastry bag or ziplock bag with cherry filling, snip off the end and pipe filling into the cones. Enjoy! Disclosure: I received Pampered Chef products for review but have not been otherwise compensated for this post. All opinions are my own. Wonderful reminder that we must continue to fight breast cancer! So cute! I love Pampered Chef. My fave tools are my silicone spatulas! These look great - I'm going to try them for my daughter's birthday! I love Pampered Chef - my favorite thing is the large covered baker. Even my daughter can use it! I've always loved pampered chef's pizza stone. I only have one Pampered Chef item and it's a spatula. It was left here by the house's previous owners, but I use it a lot! Would love to win this! Thank you so much for the recipe and the chance for the Give a way! Yum and Yumm! I love Pampered Chef! I have a few different knives that I use all the time. My favorite is the salad dressing measuring pitcher with a built in mixing wand. I love my batter bowls and handy chopper. The Ice Cream scoop!! I love it! I love the strawberry corer. I like the pizza stones. What a cute idea! Thanks for sharing. I love the silicone spatulas. I love the all stainless potato peeler! Had it for years still sharp! Love how you made this simple enough for me to use! Pampered Chef products are incredible. Thanks for the chance at them and for sharing! My favorite item of pamper chef is the can opener. So easy to use and its very safe. Also the ice cream scooper! Awesome Giveaway! I love the Help Whip Cancer promo. My favorite PC product is my large micro cooker. I use it for everything! I would love to win! I love Pampered Chef - their garlic press and lime juicer are my best friends in the kitchen! I have to many favorites to list but I always use my spatulas and cutting boards. I love all the products that Pampered Chef offers but one of my favorites is the classic batter bowl!! There are sooooo many that I love! Can't decide between the kitchen sheers or the batter bowls....or the scoops!!! The only Pampered Chef product I've ever used is the pizza stone, which I loved! Love the pink! My favorite Pampered Chief is my wooden spoons - love them! Fight cancer and cook up a storm! Love it! I use my spatulas DAILY! Love 'me. I love my Measuring cups! Love the micro fiber towel! I have never made anything with ricotta cheese (except lasagna!) so may have to give this a try. A good friend sells Pampered Chef so I have several items of theirs - no pink tho! Would be great to add to my collection! These look so yummy. I love the pink pampered chef items, so cute! I love the measuring cups! I want to get a pizza stone then that would be my favorite thing. I love my Pampered Chef stoneware. ALL of it! And your pink cannolis look yummy! I love my Mix 'N Chop!! It's wonderful for breaking up hamburger but even better breaking up Italian sausage links! You can even mash avocados with it! I still love my glass microwavable mixing bowls with the lids. I use them for everything and have had them forever. I love their pizza cutter...can't remember what it is called. They are amazingly sharp and big. I have had mine for 15 years and it still works like it did when I bought it!!! The glass mixing bowls are wonderful! I love thier stoneware and food chopper! My mother is a breast cancer survivor. Love my Pamper Chef Mix It Pitcher and these cannolis look yummy!! I forgot to add my favorite product! I absolutely love my pampered chef can opener. I thought I had lost it the day (my so hid it!) and I was so sad thinking it was gone. Love my small spatula - uae it nearly every day! My egg slicer. I use it to slice strawberries! I love Pampered Chef products! It's so hard to pick a favorite, but I would have to say my stainless steel mixing bowls! The small micro-cooker! I can steam broccoli for the kids I watch in minutes. Love it! I've never heard of Pampered Chef, how weird is that? Products look cute, though, especially in pink! I lost my mother to breast cancer in 1994, so love that you're bringing attention to it! I love all their products but especially the pizza stone. thanks for the chance to win. I have never had a cannoli. I am sure they are good, just never had a chance to sample one. I am, however, sampling the Derby Pie once it comes out of the oven! About 40 minutes left before it's done. It will be desert tonight. I love my pizza baking stone! my small spatula...so convenient for getting into the smaller pans to remove goodies. I love my pizza stone!! Use it to bake bread. I love this give away and I love pampered chef too. My fav PC item is probably my wet and dry measuring cup. I love my pizza stone and handy chopper. I loved all the stoneware, especially the mini loaf pan. I have not tried any pampered chef products. But would love to. I love the microfiber towel and the coated paring knife. I love the classic batter bowl-great for more than just pancakes! I once had the complete Pampered Chef cookware set. I totally loved it. Right now, I am missing the steamer pot and 2 covered skillets because I left them unattended on the stove and ruined them. (This happened during the time when my Alzheimer's-stricken mother was living with us, and I had to leaved the stove to attend to her.) Sure would love to get an entire new set of Pampered Chef cookware someday...sigh. Anyway, those are my favorites products, hands down. I love the large batter bowl! I own two of them because we use them so often. I Like The Pizza Stone! I love the pink paring knife! I love the pink! Yes, I have several in my family and extended family that have fought breast cancer. My favorite PC item is the powdered sugar shaker. Just love it and everything else PC. Thank you for the opportunity to win this giveaway. Love your blog, pinterest, and recipes. The Mix & Chop. I don't know how I managed to live so long without one. I absolutely love my classic batter bowl. Definitely the most used product in my kitchen. I love to have the Large Cutting Board with Juice Wells. It would make life so much easier and less messy. Glass batter bowl and dry/liquid measuring cup are my faves! It's hard to pick just one favorite Pampered Chef product.... but recently I have been getting a lot of use out of my stoneware cookie sheet, and I love it! Too many favorites to choose from! I love the batter bowl, the stones and the baking racks, just to name a few. I could not live without my chopper!! I just love my Pampered Chef pizza stone and my garlic press. My Pizza stone....have used it for a dozen years and it never fails! I love the pizza stone! It would have to be the silicone spatula! I love everything Pampered Chef! I especially love my seasonings! and Pans! and Food Chopper! My aunt is recovering from breast cancer. She had a double mastectomy to prevent cancer from appearing in the undiseased breast. I like everything that Pampered Chef has, but can't afford most of it. But, I love their little paring knife. It's the perfect size and stays sharp. I love my pizza stone! I think I'd give this to my mother in law! She'd love it! My favorite are the Pampered Chef Stones. I love my Pampered Chef food chopper. Love, love LOVE the handheld salad chopper! I love my can opener - works great! I love pampered chef! Everything I buy is so useful in the kitchen. I love the cheese knife! I would love to win this! 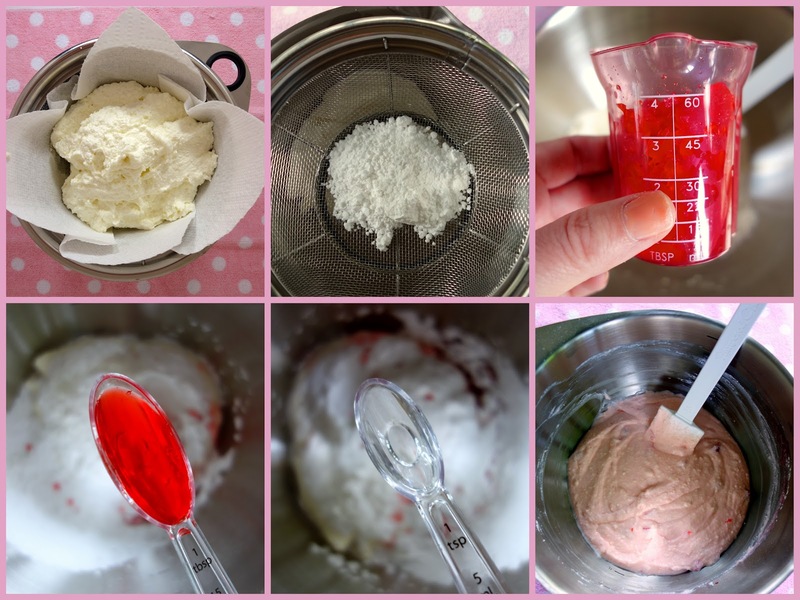 I really enjoy Pampered Chef products & have some in my kitchen! bamboo spoons - use them everyday. I love my pampered chef pizza stone! I love my Pampered Chef baking stones! Either the chopper or the springform pan, I love the chopper until it cracked and I use the springform pan all the time. I love Pampered Chef! Their cookie scoopers are great! Oh, I love their pink products! I have so many favorite Pampered Chef items that I can't wait to use from our wedding gifts :) My favorite of all time is my kitchen scissors. I use them for EVERYTHING. I love all things Pampered Chef. Right now it's my Measure-All that allows you to measure and push out things like peanut butter, honey, mayo, etc. I love the stone bakeware!! I love their knives! Thank you! I love the silicone spatulas! Pampered Chef Measure-All is my fav! My favorite is their can opener. That thing is so cool! I love their Pizza Stone and the slicers are nice. I love, love, love my mini-spatula!! I bought a second one just because I love it so much!! the polka dotted towel is just too cute! I love the classic & mini batter bowls. I love my mini spatula. I love the cute pairing knives! I love the paring knife with the sharpener! Those are adorable! I love PC products!! I love Pampered Chef! Just went to a party a couple weeks ago. My favorite product (hard to choose just one!) is the stoneware, especially the round pizza stone. Thanks! I have an oven pizza stone from pampered chef that I love. I am a Pampered Chef Consultant in the USA! I just have to say, I am so excited to see this recipe. I shared it with my host and she loved it too.. I will be making these at her show this week!